Ha gow (anglicized as Ha gow) or Xiā jiǎo is a traditional Cantonese dumpling served in dim sum. 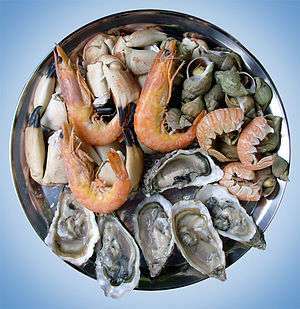 The dumpling is sometimes called a shrimp bonnet for its pleated shape. This dish is often served together with sieu mai; when served in such a manner the two items are collectively referred to as hagow-sieu mai (蝦餃燒賣). These shrimp dumplings are transparent and smooth. 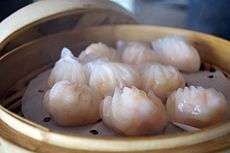 The prawn dumplings first appeared in Guangzhou outskirts near the creek bazaar Deli. This dish is said to be the one that the skill of a dim sum chef is judged on. Traditionally, ha gow should have at least seven and preferably ten or more pleats imprinted on its wrapper. The skin must be thin and translucent, yet be sturdy enough not to break when picked up with chopsticks. It must not stick to the paper, container or the other ha gow in the basket. The shrimp must be cooked well, but not overcooked. The amount of meat should be generous, yet not so much that it cannot be eaten in one bite. Wikimedia Commons has media related to Category:Har gow.